The Decision Portrait Series continues to be an artistic adventure for me. It is part embroidery, photography, and collaboration with each "model". It is also a design challenge, a conceptual development, and an organizational task. One of the very best parts of the series, however, is: "THE HUNT". I am constantly on the lookout for "models"....people who might fulfill one of the potential portraits on my "wish list". I've met some very, very interesting people because of this important series. While on scholarship at the University of Minnesota's Split Rock Program, I had breakfast in the dorm's cafeteria. On the second day, this tall, strikingly beautiful woman with a totally shaved head walked in and sat down a few tables away. I had to join her. She'd made a decision. 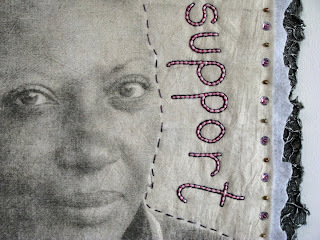 For whatever reason, I wanted to stitch this portrait. A few days later she met me in the nice computer lab. I showed her the Decision Portrait blog. She didn't hesitate, signed the model's release (yes...I carry them in my purse! ), and posed for this photo. So...here's her story. Her name is Irene Rivers. She is an incredible woman. Irene has never had breast cancer, but family members did. She shaved her head when they lost their hair as a result of chemotherapy. It was an act of love and support. It was also a way to spread awareness of breast cancer. Though her family members are now in remission, Irene continues to shave her head for others....still and act of love and support....still a way to spread awareness. Okay....she's absolutely stunning without hair....but I think that has more to do with her inner beauty! I am proud to share her solidarity, love of others, hope for healing, and her "walking definition" of real, internal beauty as a conscious decision. The best protection is early detection. Here's a link to the official Pink Ribbon website. This organization is a New York registered, internationally operating charity organization aimed to create a global community to support breast cancer patients, survivors and their families all over the world. 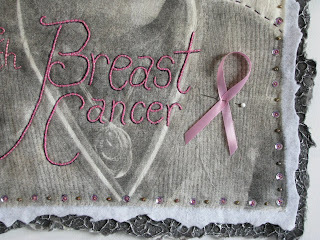 Pink Ribbon is dedicated to raising breast cancer awareness and funding for breast cancer research. I am for once at a loss for words. Your work is simply amazing. I admire all your hard work and dedication to a very worthwhile cause. I gladly follow your adventures. 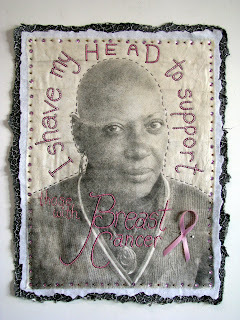 This is amazing to me after losing my hair to chemotherapy, that someone would do this because of love! What a beautiful lady.